Today has been a panicky sort of a day. My ongoing battle with anxiety and phobias continues. However, I am pleased thus far with the EMDR therapy that my new counselor is using. Brain science has come a long way since the doctors told my grandmother (years ago!) to smoke cigarettes for HER anxiety. She died of lung cancer. I never have smoked, but anxiety certainly plays a big part in my life. Thankfully EMDR therapy is non invasive and does not require drugs OR cigarette! Since January I have been battling what I thought were really bad allergies. I’ve had a great deal of nasal congestion, and lately my nose has been in pain. Strangely enough, last night my nose throbbed with pain. So even though I am DONE with doctors, this morning I finally went to an Ear, Nose and Throat physician to see what might be going on. Turns out I have cellulitis inside my nose. The panic attack started the minute I learned I had an infection that requires antibiotics. Then when the doctor sprayed lidocaine up my nose, I freaked out. The numb feeling (and HORRIBLE) taste trickled down my throat. I felt slightly nauseous, probably from the panic attack. That poor doctor kept asking me if we were okay, if he could continue. You try talking with a numb throat when you are shaking so badly you can’t even speak without your teeth chattering! I tried to go to my EMDR “safe place” in my mind throughout this examination but could not. I’m shaking right now just writing about it. He wanted to perform minor surgery, but I was not willing. I am now on antibiotics (taking each pill throws me into another panic attack. Because I can’t seem to stop them), but if I am not greatly improved by next week I will have to have the surgery done. Ugh. You see, when I was a little girl, I had an abscessed tooth that was pulled. That evening I threw up. So somehow in my brain, I connect abscesses with throwing up even though the adult me realizes the two were likely unrelated. So….the phobia about throwing up is trying to intrude into my thoughts. It’s not pretty being in my head, is it? So fast forward to Distraction City. One of my coping mechanisms for these panic attacks is to get my mind busy on something else. This afternoon I got busy doing Pre-Algebra with my daughter. I relearned how to solve problems using scientific notation. Then later on she helped me bake cupcakes for a theater class party tomorrow celebrating Dr. Seuss’ birthday. We went with a Cat in the Hat theme. 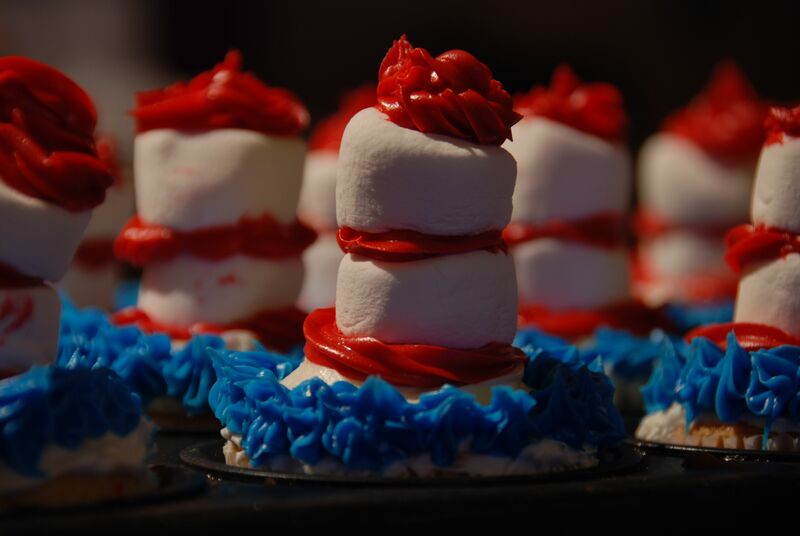 The little hats are made of icing and large marshmallows that have been cut in half. I hope they are still standing by tomorrow morning! Oh, the Thinks you can Think when you are on a mission to distract your brain! I appreciate your prayers for peace and for healing as I work through yet another health ordeal, mentally and physically. I know I am in the hands of the Great Physician. Praying for you. I have a dear friend and my sons girlfriend who have the same. Both are third generation anxiety people. They both choose the medication route and seem to cope relatively well most of the time. My friend has the additional OCD issue, so I am so proud of how well she is doing. I know most people don’t understand, but I’ve seen both of them during an episode and it’s the same feelings, just like you describe. I am sincerely sorry you have this battle. You are in my prayers. Hugs from FL! Thank you, Terri! I’ll take all the hugs from FL I can get! :o) My hope is that through the therapy I’ll eventually be able to take anti anxiety medication if I need it. The good news is that God gives me plenty of things to distract myself!